At Insomnia 49 i entered the 1v1 and 2v2 tournaments yet again in a bid to place highly and earn some much needed prize money, something which would kind of justify the amount of hours i spent playing the game trying to get good, as well as satisfy my need to achieve. Of course i failed in the 1v1 tournament. This happens every time, although my results were majorly improved, beating Dimitri 5-0, who plays for a pro team, as well as beating CooLage 2-1 after he had recently signed up to a team. Two disappointing 0-0’s, and a last minute 1-0 defeat against unknown players made my game against Dignitas’ own Adam Winster a must win, which i obviously didn’t, i lost 1-0, but considering he is the guy who won $167,000 in Las Vegas in the World FIFA tournament, i can take that and be satisfied with my efforts. Queue the 2v2 tournament then! It was supposed to be me and Mike Childs in the 2v2 tournament, but he had promised to go with CooLage instead – (they won 2v2 insomnia 48 together which i didnt realise) – and had double booked me, what a douche. (Kidding Mike you’re a lad really) Fortunately my best friends from home Daniel Fern had surprised us all by turning up on the Friday night at Insomnia, he is a great FIFA player and it was a no brainer to partner up with him. In our group we had 2 Sweetpatch.tv admins, a Dignitas player teamed up with Ollie (who is on the same gaming team as Dimitri) and crazily enough, Mike and CooLage. We lost our first game 3-1 against Ollie’s team, they were really strong though, and it was mine and Dan’s first game together. We Drew 0-0 vs Mike and CooLage, but beat the Sweetpatch.tv admins 4-1, which eventually got us through on goal difference despite a lot of confusion all round – I think it’d been a very long day for Dave and the boys. Anyway, we got through in second, and played against the Dutch national champion and his partner, which we ground a 2-1 victory out (honestly don’t know how). In the semi-finals we were up against Insomnia 48 1v1 winner, and the person who knocked me and Jack Cummins out at insomnia 47, eventually going on to win that tournament. Anyway we had a great game which eventually went to extra time and unfortunately couldn’t take it to penalties losing 2-1. That being said we had a great run and definitely put our names out there. Finally there was one last qualifying match a few weeks after the tournament had ended which i tried to qualify for, but unfortunately i lost in the semi-finals after a 120th minute corner sank me. Gutted. http://www.sweetpatch.tv/mad-catz-unveiled-fridays-tournament-has-kicked-off/ <– Here is the link to the Bracket. 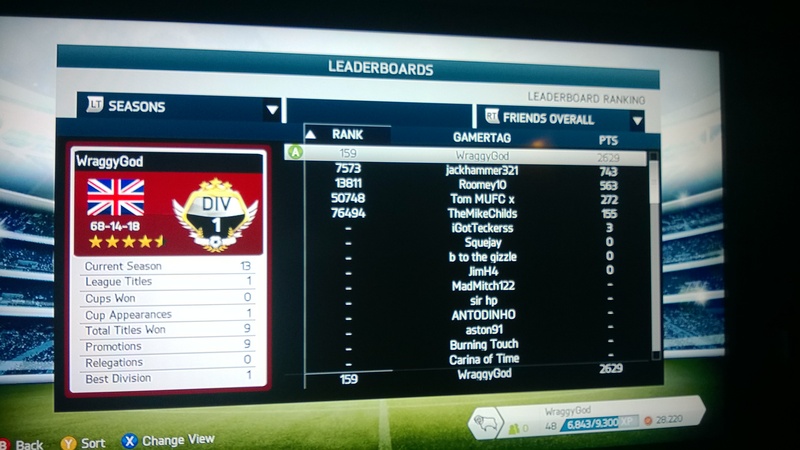 Overall i would have to say i am proud of my eventual efforts in FIFA 13, i had a lot of down time due to work, but mostly i wanted to hang around with my then girlfriend. I definitely feel as though as I met my own expectations, nothing more, nothing less. The problem i had now was motivating myself to play FIFA 14, and trying to be good all over again. After my first 3 games of FIFA 14 i said i hated it. It was slow, ugly, movement was horrible, some of the stuff was ridiculously broken, and to be fair i couldn’t get to grips with it. Once i finally overcame that small barrier and i couldn’t stop winning, i suddenly loved every second (shockingly). Although i had lost more games, and drew more, i put this down to playing against better players, that coupled with the fact i was still getting to know the game – and my internet dropping all of the time, it made for the 50-10-15 after 75 games you see there, still not bad, and was enough to put me 749th in seasons 1v1, the highest i had ever been. Higher? Could i go higher you ask? Well… Yes. Yes i could. I went on to win the Division 1 title with 8 wins in a row after losing my first game, eventually doing what i actually never could do on FIFA 13. Anyway. This was all pre-patch. I have since played 5 games post patch, won 5-0, then lost the rest.. i haven’t been able to pick up Seasons since as i have fallen out with it. It plays horribly and it’s very difficult to score and defend, which makes me bad, fml. What was the point of this blog ? You may well ask. Well i haven’t updated the website in a looooong time. I even promised a PS VITA review. So here it is. It got boring after 2 weeks and now i’m trying to sell it. There. The idea for making a new YouTube channel has been in the works for a while, there has been so much talk of lets do this and lets do that over the past year or two, however, the time has actually come and we are finally here. XboxVids1080 is a partnership with me and Jack Cummins, looking to upload our Fifa 13 games, making highlight videos, tutorial videos, general fun videos etc etc. I am extremely excited in presenting the channel, and will be uploading content for it very regularly, so please check us out at http://www.youtube.com/user/XboxVids1080, we hope to see you there very soon! Enjoy the Videos!